After leaving school Escha studied art in Florence, Italy, Salzburg, Austria and her home country Holland. Her Paintings have been sold, exhibited and published worldwide for more then 20 years. Eschas paintings are in private collections of some very famous people around the world in some of these countries: Switzerland,Austria,Peru,Luxembourg, Holland, italy,UK, USA, United Arab Emirates, Hong Kong, Germany, Mauritius, Australia,Japan,Taiwan,Ireland,Belgium,France, and New Zealand.She has worked with some of the biggest publishers in Europe and The US Such as .Sjatin.BV, PGM Artworld, International Graphics and AdLines. 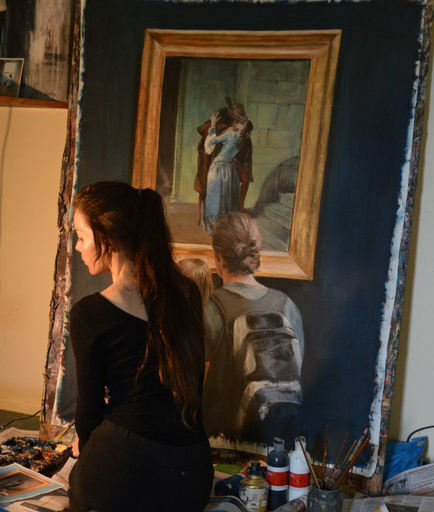 Her work was featured in Americas best Fine Art magazine in 2014, International Artist.The article included an 8 page spread of her work and the making of her work, a look inside the worlds best artist studios. Inspiration for her large acrylic paintings are the old European masters Caravaggio, Rembrandt, Da Vinci ,Veronese,Tintoretto,Canaletto,Rubens etc. who created a beautiful sense of light. Movies set in olden times and places like Venice, Florence, and the Middle East. But inspiration can also come from people, experiences good or bad and simply just life itself can create new emotions on the canvas. Painting is my passion my life, and is about sharing thoughts and emotions with others. My works of art have become extremely personal; they are an emotional response to my surroundings and experiences. These are reflections of joy, hope, peace and sadness.